Day trading in stocks is risky, more so if you are untrained. However, if you have an eye for spotting market trends, you can make a neat pile in quick intra-day deals. There was a time not long ago when trading was a simple game of buying and selling stocks based on one's conviction. Now, technical analysis- a science of predicting future prices from historical price data-has given investors new tools. "Technical analysis increases the probability of your call being right," says Abhijit Paul, assistant vice president, technicals, BRICS Securities. But, we reiterate what we mentioned in our report, "The Kick of Quick Bucks," in the October 2011 issue, though day trading looks easy, nobody can take the right call every time and there will be days when one loses money, at times a lot of it. Technical analysis is done on the basis of historical price movement plotted on a two-dimensional chart. One reason it has become popular is that anybody can look at the chart and see how prices have moved. For example, in the chart, Easy Reading, you can see open, high, low and closing prices of the Bombay Stock Exchange Sensex on July 7, 2011. Good volume and volatility are a must to gain from trading. While volume should ideally be at least 500,000 shares, the stock should have a high beta, or volatility. This means if the index rises 1%, the stock should rise by more than 1%. Those who don't understand the concept should see to it that the difference between intra-day high and intra-day low prices of a stock is at least Rs 10. Identifying the right stock and fixing a stop-loss level is a must, says Paul. One must stick to the stop-loss. Generally, stop-loss is fixed at 1.5-2%, which means the stock is sold if it falls 1.5-2% below the purchase price. Big traders generally fix stop-loss at about one-third of the expected profit. For example, if they expect a stock to rise 10% in three days, they set a stop-loss at a point the price falls by 3%. Once you zero in on the stock, look at its volumes and price trends. Generally, higher volumes with higher price rise indicate an uptrend, but it should not be considered a thumb rule. "Volume is misread by a lot of people," says John Barrett, an instructor at Online Trading Academy, which teaches stock trading. Big volumes and large moves sometimes throw up big tops and bottoms, says Barrett. This means if both volumes and prices are increasing, it may be the last leg of the rally. Identifying trends is important. But how do you spot a trend? It's difficult, as the market never moves in a straight line. A stock will never fall continuously on a given day and rise on another. "Generally, higher highs and higher lows indicate an uptrend, whereas lower highs and lower lows mean a downtrend," says Shrikant Chouhan, senior vice president, technical research, Kotak Securities. "Look at the trend. Look at news related to the stock," says Chouhan. For example, if the rupee is falling against the US dollar, it's common knowledge that technology companies will gain. Analysts and market experts take the help of various parameters to confirm if a stock is a trade pick. The most used are available in any technical analysis software. These include 200-day moving average, relative strength index, moving average convergence divergence, or MACD, Fibonacci retracement and candle stick price chart. The terms may sound daunting, but software available nowadays makes technical analysis easy. One of the widely used tools is the 200-day moving average. You simply have to plot the 200-day moving average on the price chart. When the price of the stock rises above the moving average line, it's a buy signal, and when the price falls below the moving average line, it is a sell signal. One can also look the 50-day moving average or the 10-day moving average. Trading is a game of probability. So, you have to arrive at your own methods to decide which parameters suit you the best. In the graph, Moving Averages, you can see the Sensex movement compared to the 200-day moving average of the Sensex. The brown line is the moving average line. In February, the line went above the price bars and the Sensex started falling. When the 200-day moving average fell below the price bars in April, the markets started going up. 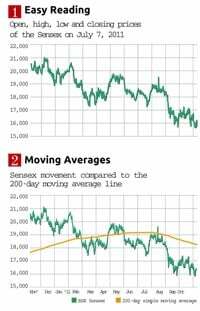 In thegraphic, the Sensex is below the moving average, indicating bearishness. But this is just one parameter. RSI compares the magnitude of recent gains to recent losses to see if an asset is oversold or overbought. RSI is plotted on a scale of 0-100. Generally, if it is above 70, the stock is considered overbought and so one can look to sell it. Similarly, an RSI of less than 30 indicates the stock is oversold and can be bought. In the chart, Relative Strength Index, you can see that RSI was near 20 in October 2011, signaling that L&T's shares were oversold. It reversed from 20 and the stock moved up. This is a very important tool used by technical experts. You just have to select the MACD and plot it on a chart. The MACD comprises two lines, fast and slow. The fast line is the difference between the 26-day exponential moving average and the 12 day-exponential moving average. The slow line, also called the signal line, is the nine-day moving average. So, the blue line in the chart, MACD, is the fast line and the brown line is the slow line. With technology, these calculations are automated and a graph gets plotted at the click on the mouse. When the fast line crosses above the slow line, it's a buy signal, and when the slow line crosses the fast line, it's a sell signal. The chart shows that the MACD is the best way to predict the movement of a stock. Fibonacci retracement is based on the assumption that the markets retrace by a few predictable percentages, the best known of which are 38.2%, 50% and 61.8%. So, when the market retraces 38%, it will generate either a sell or a buy call depending on the trend. You have to plot Fibonacci retracement from the peak price. The software will give the above mentioned retracement levels. When the price reaches the 38.2% level and bounces, it means the price of the stock at which the chart plots the 38.2% retracement is the support level and you can buy. However, if the price falls below the 38.2% level, you may look at the price at 50% retracement level as your next support. The chart, Fibonacci Retracement, shows how the 38.2% retracement is working well for the Ranbaxy stock. You may hear or read technical experts recommending support and resistance levels. But plotting support and resistance and finding it yourself is a simple job. As you know, prices move in a zig-zag fashion and form lows and highs. A support is plotted at the daily low price and resistance at the daily high price. For example, in the given chart, Chouhan says he sees support of 4,700 for the Nifty and if the index falls below this, it may fall further to 4,300. He has plotted resistance at 5,177 levels. Take a look at how he managed to get support and resistance for the Nifty from the October 7 graph, Support and Resistance.